Tugela Falls, in South Africa, is located in the Drakensberg within the Royal Natal National Park. 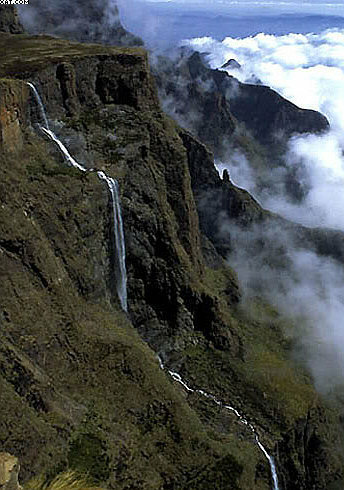 The combined total drop of its five distinct free-leaping falls is 948 m and it is accepted as the world’s second-tallest waterfall. The Royal Natal National Park is in the KwaZulu Natal province of South Africa and forms part of the uKhahlamba Drakensberg Park World Heritage Site. The main features of the park are the Drakensberg Amphitheatre, a rock wall 5 kilometres long by up to 1,200 metres high, Mont-Aux-Sources peak where the Orange and Tugela rivers have their origins and the 948-metre Tugela Falls. The Tugela River is known to vary greatly in volume and as a result may not flow consistently year round or may dry out completely during certain periods. At the right time of year, however, the Tugela Falls is easily visible from the main road into the park, especially after a heavy rain. Tugela is a phonetic spelling of the word “Thukela” (Zulu) , meaning “sudden” or “startling”. There are two trails to the falls (from within the park). The second trail’s means of access follows the Tugela River upstream through the Tugela Gorge. This trail is 7km in length and the gradient is not so steep as the first trail. The trailhead is roughly 1585m above sea level. Before venturing on your trip, please check the weather. And remember a comprehensive hiking guide is available for purchase at the Visitor Centre at the main entrance gate. The guide shows a map of the park and the network of hiking paths which visit every part of the park.